First and foremost is Mikhail’s family. 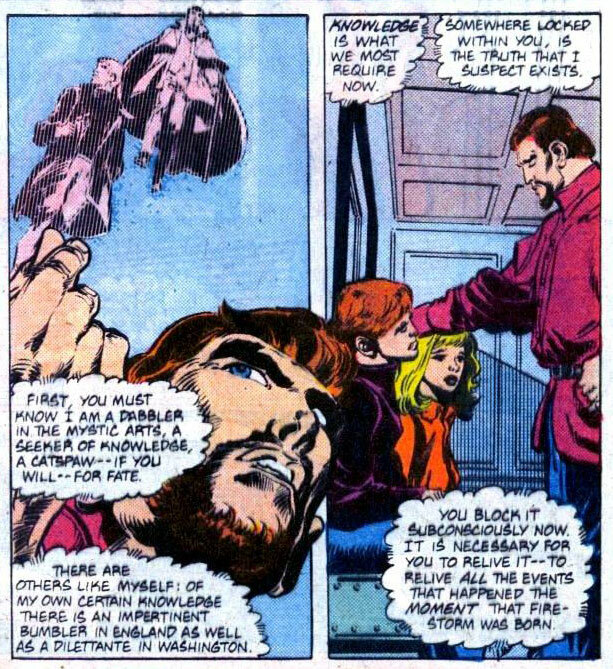 Mikhail was a committed family man, even though the duel life of Firestorm sometimes created difficulties. In the image below you’ll see (from L to R): Serefina Arkadina (Mikhail’s niece, a.k.a. Firebird), Mikhail with his two daughters (Irena and Sofia), Nina Arkadin (Mikhail’s wife), and Alexander & Sylvia (Mikhail’s brother and sister-in-law, and parents of Serefina). Alexander often came to the rescue, whether it was securing release for Mikhail from the KGB or securing Mikhail a teaching position at the University. While Alexander was helpful, he was also very critical of Mikhail. 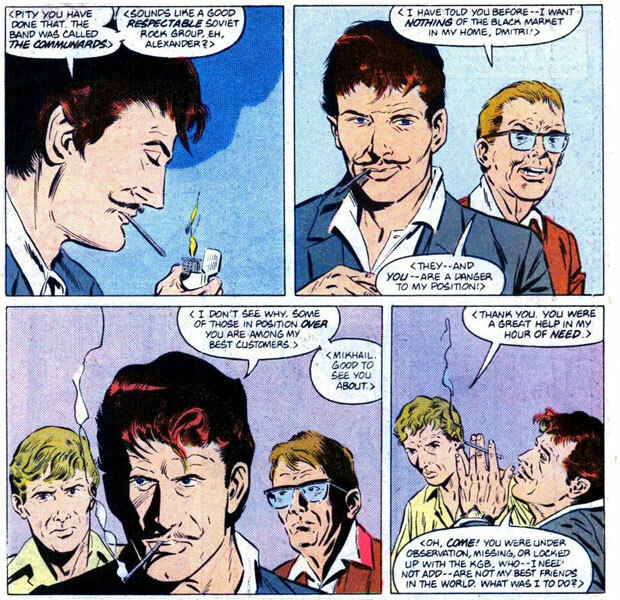 As an employee of the Soviet government, Alexander was concerned about Mikhail’s seemingly erratic disappearances (truthfully, the time Mikhail was away as Firestorm). Next up is Mikhail’s other brother, Dmitri. Dmitri’s life had taken a dramatically different path from either Alexander or Mikhail. Dmitri was a black market profiteer. While his dealings were shady, he was very kind to his extended family. Below you’ll see a typical Arkadin brother gathering. Mikhail’s niece Serefina had telepathic powers. 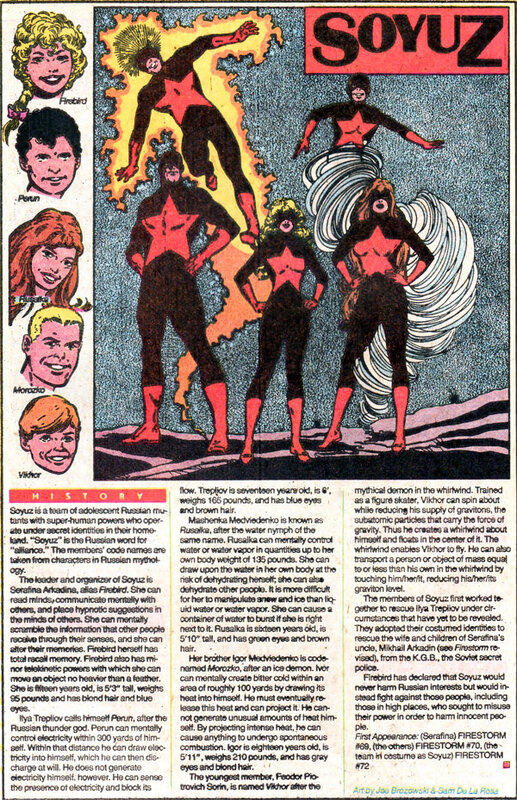 She adopted the superhero codename of Firebird and organized a team of other super-powered teenagers. Soyuz was the Russian equivalent of the Teen Titans. Below you’ll find their Who’s Who entry from Who’s Who Update ’88 #3 (Oct. 88). Click the image to enlarge. Next up is Gregori Eilovotich Rasputin, an acquaintance of Dmitri’s. Rasputin was a mysterious man with occult powers. 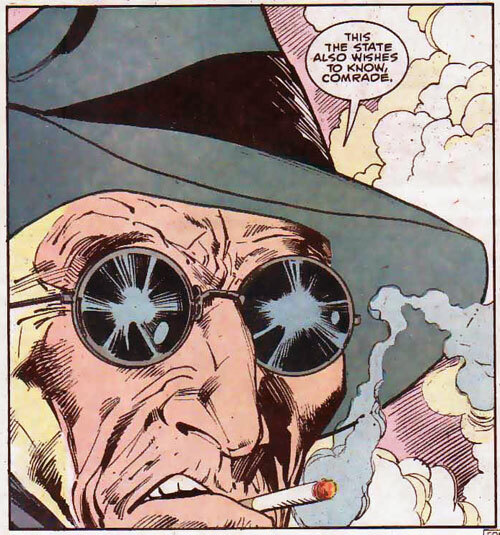 When asked if he was descended from the mad monk of legend Rasputin, his response was, “Perhaps I AM the mad monk of legend.” Rasputin helped Ronnie and Mikhail better understand the true nature of Firestorm, which lead to the creation of the first Elemental Firestorm. Now we’re moving on to Pozhar’s adversaries! First up is Stalnoivolk/The Steel Wolf (Ivan Illyich Gort). He was sort of like a Soviet Captain America with the face of Joseph Stalin. He wasn’t a super villain, he was just a super-powered soldier that followed orders. A very dangerous and destructive cold war relic. Below you’ll find his Who’s Who entry from Who’s Who Update ’88 #3 (Oct. 88). Click the image to enlarge. Major Zastrow is a creepy old bald guy with a tremendous amount of clout with the KGB. 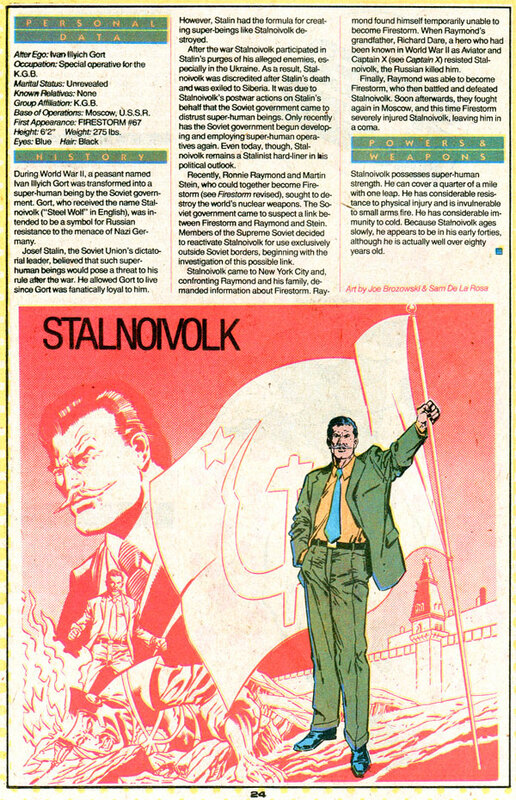 He’s like the Soviet equivalent of Amanda Waller and is the head of a secret covert operations team called the Red Shadows. He created numerous headaches for Mikhail and his family. Below you’ll find a shot of Zastrow. Finally we have the Zuggernaut. Not the most fondly remembered of Firestorm villains, but his origin was tied to the Soviet Union. Zuggernaut seemed to have been inspired by the creatures from Aliens, but maybe that’s just me. 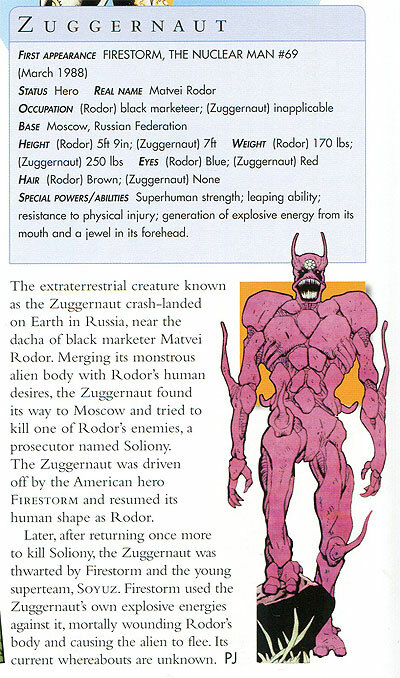 Below you’ll find Zuggernaut’s entry from DK’s DC Comics Encyclopedia, Updated and Expanded Edition (September 2008). That’s it for today! Come back next week where we’ll wrap-up our look at Pozhar! Support Firestorm (and Pozhar)! Fan the flame! Posted in: Firestorm #02: Blank Slate (Ron/Mikhail/Stein), Mikhail Arkadin/Pozhar, Who's Who.